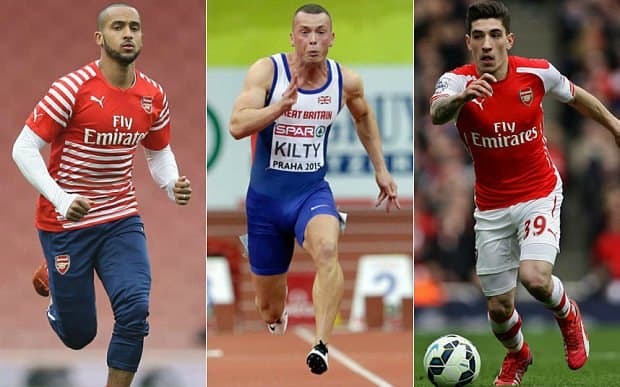 The topic of Arsenal’s Hector Bellerin’s 40m sprint time recently surfaced when they compared his time to Usain Bolt’s 10m split times. The media probably referenced my splits from Usain Bolt’s 2008 and 2009 performances (see chart below) where he ran 4.65 and 4.64 respectively for 40 meters en route to 100m. Note these times account for wind and reaction time! Héctor Bellerín reportedly ran 4.42 for 40m at his football camp. No video. For some reason, the media world has taken these stats by storm (thanks to social media) to the point where Richard Kilty is challenging a “put up or shut up” contest with £30,000 on the line. 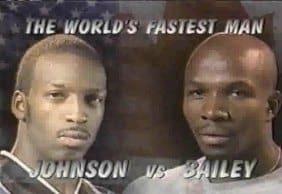 We all remember when Michael Johnson claimed he was the World’s Fastest Man, by averaging his 19.32 200m time (9.66 x 2) being faster than Donovan Bailey’s 100m time of 9.84! 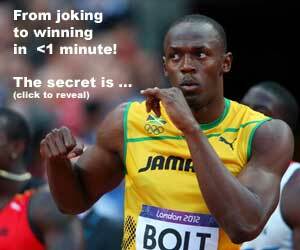 It doesn’t take a genius to figure out the 2nd half of the 200m time has a running start! 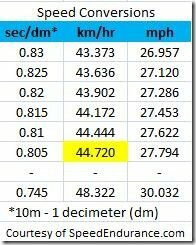 Conversely, You can’t extrapolate a time of 4.42 for 40m to be 11.05 seconds (2.5 x 40m = 100m). Is that 4.42 hand timed? Does it factor in reaction time of 0.165 seconds? Does it factor in deceleration after 60m or 70m as seen in world class sprinters? The only time that equation is true (2.5 x 40m = 100m) is in a high school physics text book or SAT exam, assuming there is a frictionless surface and in a vacuum to negate air drag! The reason I bring this up will be evident below… read on. The winner of the 100m Olympic Gold Medal (The Olympic shortest sprint distance)? The “average speed” in meters per seconds, or miles per hour? A radar gun (like a police radar) at an instantaneous point of time? You see, the above all are based on time over distance. I used the terms “quicker” and “faster” when discussing the Moye blocks. You can be quick, but not fast. You can be fast, but not quick. Then there’s the trade-off between being too quick or too powerful out of the blocks, but we’ll save that for another article. The problem with being quick, like the Moye blocks, is you are standing up sooner and have better leg turnover, but no power. It’s like pushing a car stuck in the snow for all my friends in Montreal and the East coast USA. Are you vertical, or more horizontal for more power? The term “Faster” means either “farther” (greater distance) or “sooner” (less time). In order for you or me to calculate the speed of an object, we must know how far it goes AND how long it takes to get there. When you ask “how far”, are you referring to the distance, or the displacement? Speed is the rate of change of distance with time. Velocity is the rate of change of displacement with time. Remember high school or college physics? Speed is a scalar and velocity is a vector. Speed gets the symbol v (italic) and velocity gets the symbol v (boldface). How are they Calculating speed? How does Héctor Bellerín rank in terms of average speed in miles per hour? If 1 Meter per Second = 2.237 Miles per Hour, then 4.42 for 40m is 9.049 m/s or about 20.24 miles per hour, average speed for 40m. Something doesn’t add up with these numbers. Are they using the full 40 meters average speed, or possibly the last 20m split? If they are using the full 40, then Moussa Sissoko ran 4.06 for 40m? I doubt it. If you’ve seen Héctor Bellerín play, you think something is flawed! The average sports fan and TV viewer prefers (at least conceptually) the measurement of time. Of course, the average television fan doesn’t consider other factors such as wind, altitude, track surface, or modern technology such as speed suits or high tech sprint spikes. But we really should be using velocity. The problem with measuring time is it doesn’t show the whole picture. There are many components to 100 meter race. Then again, they don’t give gold medals to the fastest 10 meter segment, or 40 yard dash for that matter. It doesn’t take much to figure out that the 3 secrets of a great 100m time is reaching top speed (acceleration), a fast top speed (maximum velocity), and maintaining that top speed (speed endurance). Perhaps splitting atoms is easier? 0.83 sec/10 meters translates to 12 meters per second (m/s) or almost 27 miles per hour (mph) or 43 kilometers per hour (kph) (see chart on left). You can’t use these miles-per-hour numbers unless you are consistent. 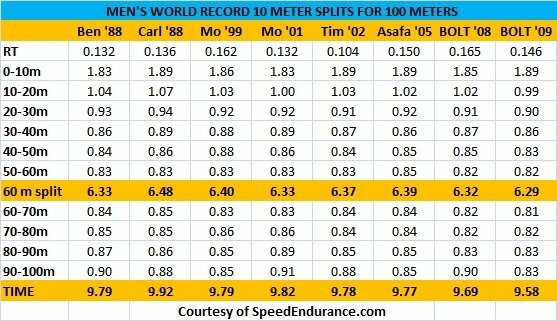 Very few elite sprinters have reached the 12 m/s “speed limit” (or 26.8 mph), that list includes Tim Montgomery, Maurice Green, and Ben Johnson. Of course, add today’s superstars like Asafa Powell, Tyson Gay and Usain Bolt. Only in Beijing 2008 did we see Usain Bolt drop that to 0.82 sec/10 meters, then dropping again to 0.81 sec/10 meters in Berlin 2009. Shoes. Are we using football cleats or boots, or track and field spikes? Converting a hand time to FAT with 0.24 seconds. Sorry, but a 4.42 hand time is really 4.5 HT rounded up, or 4.74 when “converted” to FAT. Reaction time. Football’s 40 yard dash don’t go on a starter’s pistol but on an athlete’s motion or breaking a beam (also dependent on the athlete). The average reaction time among elite sprinters from the gun to the moment they exert pressure on the starting block’s electronic pads is about .15 seconds, and anything less than 0.10 seconds is considered a false start. So in track, you are automatically adding 0.10 seconds. Wind. In track, a tail wind of up to +2.0 m/s is allowed. Is there wind inside a football stadium? FAT timing start and finish. Football’s 40 yard dash start is hand timed, and the finish is “electronic”. As long as they are consistent with their own athletes, that’s fine, but don’t compare that to track FAT sprint times. We don’t know exactly how the Premier League Football internal 40 meter time is calculated. But the points above will hopefully point out the differences, and hopefully there are. … the song remains the same. Let’s move on.